With technology, it’s less about joy than about utility. Does this object really have a use in your life? Is it making your life easier or just taking up space? Would a cheap upgrade to a better version of that item bring you fewer hassles? Those are the questions you should ask as you examine your aging tech products. A good rule of thumb: if you haven’t used something in six months, it probably should be on its way out of your life. —Old cables and adapters. If you don’t know what a power cable or adapter is for, YOU DON’T NEED IT. Older cables such as S-Video and Component should be purged unless you need them for a specific gadget you’re still using. My rule of thumb is to keep one kind of each cable (USB, RCA, etc.) as a “just in case,” but even that might be overkill. Any cable that’s frayed or doesn’t work reliably should go. Keep HDMI cables unless they’re not working properly. —VCRs, tape decks and non-Blu-Ray DVD players. It’s a cumbersome process to transfer old home videos and cassettes to digital, but it’s got to be done sometime. Those old tapes are only going to keep degrading. There are local businesses such as Save Your Tapes that will do it for you, or you can invest in a gadget for transferring yourself (warning: this can be very time consuming). If you’re not willing to let go of your DVD collection, DVD players can be pretty cheaply replaced with Blu-Ray players (they also play regular DVDs) or even a 4K Ultra Blu-Ray player. These newer devices can typically also can access Netflix, Hulu and other streaming services. —Old game consoles. Unless you’re playing those games or saving them for your kids, trade or sell them to a store such as Game Over Videogames or donate them. A lot of games from old consoles are readily available for newer game consoles. —Old thumb drives and external hard drives. Transfer the contents of smaller drives to one big one (and remember to have a backup) or if you trust the cloud, keep the bulk of your files there. Do a secure format of any old storage media you plan to donate or if you’re paranoid, just destroy the hard drive before sending it to a recycling center. Storage is cheap and solid-state drives are much faster than traditional hard drives. Old drives age fast. —Computers. Slow and barely functional? Upgrade. But make sure to clear out your data and de-authorize apps such as iTunes that are used on multiple devices. —Kitchen gadgets. Is your toaster barely functional and full of crusty crumbs from the early 2000s? Don’t make cooking any harder than it has to be; get rid of any kitchen tools that are clinging to life. —Old software. There’s really no need to keep discs of old versions of Windows or TurboTax 1998. Destroy or recycle old installation discs. —Cameras. If you’re a photography hobbyist, by all means hold on to that gear. But if you’re like most of us and taking most of your photos with your phone, you probably don’t need an old point-and-shoot camera anymore. Donate. —Smartphones and tablets. Smartphones age really quickly through software updates, but sometimes it’s worth hanging on to a phone or tablet after you’ve upgraded. If you have kids like me, a non-activated smartphone can make a good internet device and music player. And some people use an old phone or tablet as a smart home controller / remote control or even an always-on security camera. —Land lines. Yes, we have cell phones, but if you work out of your home and live in an area with poor cell reception, a phone land line is probably a better solution than relying on Skype and other internet services all the time. —Computer monitors. Upgrading to a new monitor usually means getting rid of the old one, but if you do a lot of desktop work, having a second or even third monitor in your home office can be a game-changer. —Streaming boxes. An old Roku or Apple TV might not be your best option for family room viewing if you have a new 4K television, but they can make a good option in a bedroom or guest room, especially one not wired for cable/satellite. Now that you have decided what should stay and what should go, you have a lot of options on what to do when these items. For newer tech such as tablets and smart phones, the best first option is probably to try selling or trading in if you’re in the market for new gadgets. Gazelle, NextWorth, Craigslist and Ebay are good places to start, as well as more locally focused apps such as OfferUp, Mercari, Letgo and even Facebook Marketplace. If you’re selling to individuals instead of a company, be prepared for flaky people, offers to trade and lowball offers. But a little cash is still better than nothing. Donating your tech is always a good bet. Goodwill is usually my go-to, although there are some local organizations such as the Boys and Girls Club of Austin that are looking for specific items such as lightly used desktop computers, tablets and professional camera equipment. If you keep track of donations for tax purposes, don’t forget to ask for a receipt. 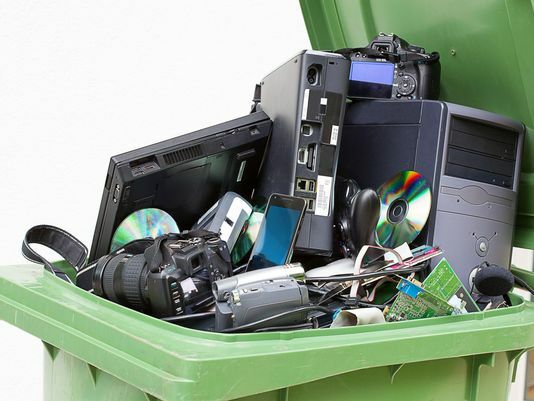 Recycling is always a much better option than just throwing your old tech in the trash. Best Buy and Target are good places to unload non-functioning phones, cameras, TVs, old ink cartridges and some appliances.